Posted on Thursday, September 11th, 2014 by CommunityEngagement. Dr. Nicholas Williamson’s class is anything but typical. In fact, it’s in a league of its own. In just 12 weeks, undergraduates in “MKT 426, International Marketing” go way beyond the textbook, directly working with North Carolina-based companies to export their products to another country in a project known as Export Odyssey. A recent research study discovered that no other program in the nation offers marketing and entrepreneurship students the kind of experience and skills they attain in Export Odyssey. “When it comes to the mission of the university and of the Bryan School [of Business and Economics], this course hits it all: economic development, community engagement, hands-on learning,” Williamson says. Williamson has been with UNCG for 31 years, offering some form of the Export Odyssey course from the beginning. A chance encounter back in 1988 sparked one of the ideas that led to his course’s innovation and success. One day after class, Olga Topping ’88, a student from Colombia, was making a call from a pay phone in the Bryan School. A stack of quarters at her side, Topping was negotiating with a purchasing agent of a major retail chain in Bogotá. From that point on, Williamson incorporated a new course requirement: students must attempt to sell a product produced in North Carolina to at least three buyers in the foreign country that offers the best exporting potential. Over time, Williamson has continued to evolve the course to increase students’ success. 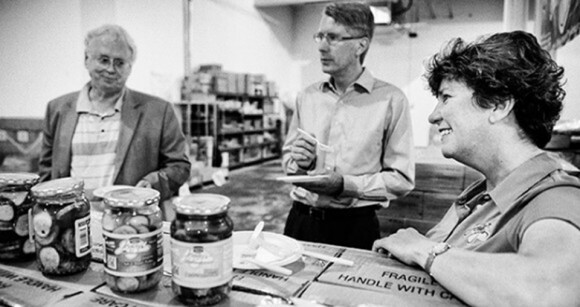 Enter Williamson’s second big idea, partnering with Steven Cramer. Cramer, a Coleman Fellow for entrepreneurship education, is the business librarian for the Bryan School. He has helped Williamson revolutionize the course by teaching students how to use hundreds of millions of electronic records pertaining to the product they are trying to sell. In addition to co-authoring Williamson’s Export Odyssey textbook, Cramer teaches students how to make highly strategic exporting decisions by analyzing internet data to determine true competitiveness. These approaches to learning lead students to success after graduation. Olga Topping, who is now vice president and sales manager with the International Division of BBT, is just one of a long list of student success stories. Kevin Scott ’13, whose team helped business owner Jenny Fulton export Miss Jenny’s Pickles from Kernersville to the U.K., is currently a logistics coordinator for Dravco, Inc. He says the course helped to shape his career and positioned him to succeed in a role that requires wearing many hats. Right after graduation, Dustin Miller ’08 operated a flourishing exporting business in which he sold guitars to every major modern country in the world.